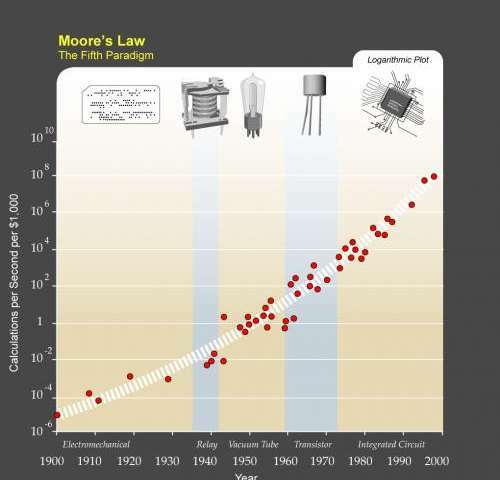 Kurzweil writes that, due to paradigm shifts, a trend of exponential growth extends Moore's law from integrated circuits to earlier transistors, vacuum tubes, relays, and electromechanical computers. He predicts that the exponential growth will continue, and that in a few decades the computing power of all computers will exceed that of human brains, with superhuman artificial intelligence appearing around the same time. Courtesy of Ray Kurzweil and Kurzweil Technologies, Inc.
(PhysOrg.com) -- In its essence, technology can be seen as our perpetually evolving attempt to extend our sensorimotor cortex into physical reality: From the earliest spears and boomerangs augmenting our arms, horses and carts our legs, and fire our environment, were now investigating and manipulating the fabric of that reality  including the very components of life itself. Moreover, this progression has not been linear, but instead follows an iterative curve of inflection points demarcating disruptive changes in dominant societal paradigms. Suggested by mathematician Vernor Vinge in his acclaimed science fiction novel True Names (1981) and introduced explicitly in his essay The Coming Technological Singularity (1993), the term was popularized by inventor and futurist Ray Kurzweil in The Singularity is Near (2005). The two even had a Singularity Chat in 2002. While the Singularity is not to be confused with the astronomical description of an infinitesimal object of infinite density, it can be seen as a technological event horizon at which present models of the future may break down in the not-too-distant future when the accelerating rate of scientific discovery and technological innovation approaches a real-time asymptote. Beyond lies a future (be it utopian or dystopian) in which a key question emerges: Evolving at dramatically slower biological time scales, must Homo sapiens become Homo syntheticus in order to retain our position as the self-acclaimed crown of creation  or will that title be usurped by sentient Artificial Intelligence? The Singularity and all of its implications were recently addressed at Singularity Summit 2011 in New York City. 	Large computer networks (and their associated users) may "wake up" as superhumanly intelligent entities. 	Computer/human interfaces may become so intimate that users may reasonably be considered superhumanly intelligent. 	Biological science may provide means to improve natural human intellect. For Kurzweil, the core of the Singularity remains the augmentation and surpassing of human biology through the accelerating evolution of technology (notably genetics, nanotechnology, and Artificial Intelligence) enabled by exponential increases in computational power and speed coupled plummeting costs and size. Not surprisingly, then, in his opening address, From Eliza to Watson to Passing the Turing Test, Kurzweil  ever the low-key evangelist  focused largely on what he described as the remarkable continuing evidentiary support for his original projections. He voiced a clear differentiation between basing our AI offspring using biologically-inspired principles and, alternatively, crafting biomorphic substrates: In short, he favors the former, viewing the latter as unnecessary. That's really the big frontier right now is for computers, in general, to master human emotions. Emotion is not some sideshow to human intelligence. It's actually the most complicated intelligent thing we do, being funny, getting the joke, expressing a loving sentiment. That's the cutting edge of human intelligence. If we were to say intelligence is only logical intelligence, computers are already smarter than us. I believe it's going to be about over the next 20 years where we close that gap in terms of human superiority today in emotional intelligence. Today computers can understand human emotions in certain situations. Watson, the IBM computer that won Jeopardy, did have to understand some things about human emotion to master the language in that game, but they're not yet at human levels. They're getting there. True to the Singularitys premise of accelerating technological innovation, this achievement may be arriving sooner expected: Recently, research conducted by Zoraida Callejas, David Griol and Ramón López-Cózar at the University of Granada and University of Madrid, has demonstrated a method for predicting a persons mental state in spoken dialog from that individuals emotional state and intention by means of a module bridging natural language understanding and dialogue management architecture. MIT wunderkind Alexander Wissner-Gross says that it will be sufficient for a post-Singularity AI to understand human feelings rather than having to develop emotive thought. In his much-anticipated talk, Planetary-Scale Intelligence, he suggested that a global human-level AI could emerge from the mathematical world of quantitative finance and high-frequency trading  and that it may already have. In The Undivided Mind  Science and Imagination, filmmaker, aesthetic philosopher and ecstatic futurist Jason Silva  the speaker that most energized the crowd  called for passion and artistic sensibility to inform ideation and instantiation of the Singularity. Silva displayed this perspective by showing his short film The Beginning of Infinity, which visually expresses an epistemological epiphany. Silva is also the first guest to be interviewed on Critical Thought TV. Whats fantastic about having a Singularity Summit, Silva notes, is that it provides an anchor that gives legitimacy to these ideas  that theyre not just something on the fringe of academia. Our story then spills over into a variety of substrates  books, magazine articles, television, film, websites, and so on. However, he points out, I think they need to work on their aesthetic framing  the essence of his talk  which I hope provided an injection of art and design. As Rebecca Elson wrote in her book, A Responsibility to Awe, facts are only as interesting as the possibilities they open up to the imagination. For Silva, one of those possibilities is our achieving the God-like qualities of immortality and omniscience long promised, but never delivered, by religion. Silva also differs from Kurzweil and Wissner-Gross in his view of emotion in coming human-analogous AIs. For example, he refers to Leonard Shlains Art & Physics, which Silva cites as pointing out that art and science are two sides of the same coin. Silva agrees that this appears to be supported by fMRI studies of human brain activity, which seem to show that their common ground lies in the emotional content of experience, as well as by very recent findings that visual encoding in the human ventral temporal (VT) cortex is common across individuals viewing the same movie content. If you read M.Kurzweil's book, he predicts that around 2045 the Singularity will be possible. If you read physorg.com daily, you can imagine it may be well before 2045. But very possible indeed. New challenges will come, but some of today's challenges will be something of the past. I can imagine myself sitting in my room with some highly advanced nanochip in my brain, and thanks to, realistic as real life virtual reality(sth like Matrix) I will be travelling back in time. I imagine being composed of nanites, with a fusion powered core. With a remarkable understanding of reality (All will have the knowledge, or we will all be one), an unprecedented increase in intelligence, and near unlimited power...we will remake the universe with our imagination. This I believe is the only path to "heaven" or "hell". In 2045, 14-year-old kid currently working on quantum simulations of his new robot design, will learn that long ago, some primitive pre-quantum-age people thought that human brain is equivalent to old, classical computer, that human mind could be downloaded into such a computer, or that those stupid classical machines could be more powerful than quantum-enabled human minds. "Such a nonsense, how can be people even so stupid? ", thoughts he. We must remember the huge chasm that is present in our world! There are those that do not WANT to advance, there are natives that still live in huts, there are people that live in a "natural" way. Biological evolution is slow, so as we advance ourselves artificially we create a huge difference between the most advanced and the least advanced. Just as Grandpa hates using a computer, there are those that will prefer not to live in a superhuman/augmented reality/genitically modified society. If this gap becomes too wide, would it not start a war? Wouldnt the more advanced of us see no need for our slow-thinking, normal human brethren? Wouldnt the more advanced of us see no need for our slow-thinking, normal human brethren? If the augmented are a function of their wealth, you may very well have a point. You could end up with a Eugenics Wars a la Star Trek. However if it is a post-scarcity society and anyone who wants it can have it, I doubt it would play out that way. As long as the primitives didn't try to perform acts of terrorism I doubt there would be any desire among the augmented to exact any harm upon them. Even then I doubt the augmented could be whipped up into enough of a furor to commit genocide. Their technology and thought would likely be so advanced that the primitives wouldn't really be capable of harming the on a large scale. The point is I doubt it would be the augmented wishing to eradicate the non-augmented, but the opposite, likely on silly religious grounds. Frank, if this future world is somehow not dependant on limited resources, then you are probably right. But if the population continues to balloon, farmland becomes more limited, we will see wars, regardless of what sides there are. of us see no need for our slow-thinking, normal human brethren? Limited resources and post-scarcity are not mutually exclusive. Are there a limited number of protons in the universe? Yes. Are protons scarce? No. With the perfection of fusion, and possibly unforeseen technologies, there is no reason to believe the Earth could not sustain many more people than it currently does at a much higher quality of life for all. It's optimistic but not foolish. If not for the Green Revolution we'd only be able to feed what, 1 billion people? Technology is already far surpassing the Earth's "natural" abilities to support humans. There is no reason to expect this trend to stop. Yes, but could we not start building 3D hardware circuitry? Layer upon Layer till you get what you want! Thats what hardware is doing right now. We need Quantum computers, or articial neurons. Classical computers will reach a limit at some point or another, we need a new technology to keep those increases coming! There is plenty of space/room behind a monitor for many CPUs. Computers outperform humans in many tasks. Even if computers are basically tools their capabilities are amazing. Computers save lives everyday. Computers will save even more lives in the future. While I agree that Moore's law will probably come to an end at the end of the decade for integrated circuits, what about all the progress that is already being made in quantum computers. D Wave sold a basic quantum computer to Lockheed a few months ago. So I think quantum computing is what will take us beyond the age of the integrated circuit in the 2020s. Imagine having computers so advanced that they can design the next generation of computer and so on. Imagine simultaneously perfecting the link between human brains and those computers. Every human able to instantly be a physicist, mathematician, biologist, etc. Merging human ambition and imagination with nearly unlimited access to the knowledge needed to realize those dreams. I wonder if we will have discovered faster than light travel and have left this planet for another galaxy before 2100. With so much processing power and imagination efficiently linked, we may get to the future a whole lot faster than we realize. Sounds like a plan... Get on board for the big win, kids. It would be very fun to save this thread to look back on to see just how wrong most of our opinions will turn out to be. Vendicar makes a good argument but somehow I think that all the limitations will be overcome to continue Moores law into the foreseeable future. Demand is driving innovation by providing huge amounts of capital for research into advanced materials and process technology and some very smart people who don't toil away their time pontificating on physorg will make advances we can't even imagine today. The "singularity" is nonsense without accounting for a couple factors that are at least as important: Dispersion and fitness. William Gibson first observed that the future is already here, just not well distributed. Aside from dispersion, you must account for whether or not emerging technologies solve actual problems or are just more fantasy games. Are they practical? Affordable? Sustainable? Efficient? There are lots of ways to do things wrong. Talking about Singularity means little if the walk through leads to stumbling. I agree that it is kind of silly to try and predict the future with any specificity. In a time of technological change it is impossible to really say what will happen (saying nothing about any Singularity). We just need to see how it plays out and try to make ethical decisions. Good point on adiabatic quantum computing. I am not really read enough to make statements on that field heh. However it seems a lot of people are researching quantum physics. Why does the graph end in the year 2000? You singularity people are pathetic. Or are you trying to mislead at this point? "More information: The 2nd part will be published tomorrow." It will come to that. If your children's children play their cards right, they may manage to become the pets or our machine replacements, rather than simply extinct. Even now with our limited intelligence we know not to reinvent the wheel every time a new problem comes along. Why do away with what millions of years of evolution have produced? A primate with exceptional concentration and awareness that can communicate well enough to be useful. Face it, these computers are going to be enhancing us, not replacing us. It's simply the most cost-effective method. I wonder if technology can get to the stage where brain/tech interfaces rely entirely on non-invasive magnetism for two-way interaction. Why? Nobody wants to be an early adopter when early adoption means surgery. Even now with our limited intelligence we know not to reinvent the wheel every time a new problem comes along. Wrong. Just really, really wrong. There are countless examples of things where, regardless of the level of understanding, the proven technology, the knowledge available, we continue to do the stupid thing time and time again. This is just one of the reasons that I think the concept of a mapping out a timeline for a singularity event is a little silly. Of course, it's hard to define "singularity event". What it means really depends on whom you ask, as this is not some sort of scientific term that has wide acceptance. In fact, it's been written about in science fiction far more than outside that realm. In any case, it's pretty easy to do a little history reading to get a feel for how technology and innovation happen in a herky-jerky fashion that is difficult to predict. You are truly out of your gourd. I, too, am a huge fan of science fiction and enjoy fantasizing about these things. But, that doesn't make them reality. By 2100, we will be very, very lucky if we leave the solar system, let alone the galaxy. The article, as well as most of the comments, can be, and should be a subject of criminal prosecution. In my country, to call for support for an authoritarian regime that would enslave human beings, is criminal act. I am sure the same holds for any civilized country. Despite free speech, open support for anti-human, slavery-enabling, fascistoid society with human beings as slaves, is open attack against constitutional rights. The pure belief of author and his fellows, that human beings does not posse mechanically irreducible qualities that make humans superior to any machine, does not allow him to implement his anti-humanistic picture into reality; we have plenty of examples of such attempts with tragic outcomes from not-long-ago past. We should stop all the potential murders masked as messiahs right now! a) All effects have limits. There are always boundary conditions, saturation effects, etc. which will counteract the trend at some point - forcing it to level off. Ever accelerating innovation is also a myth. It will, too, be limited (if only by the laws of physics themselves. But still, that IS a limit). We hav more people researching stuff - at the same time stuff gets more complex. This will one day counteract the increase in research speeddue to technology or numbers of researchers. Prime example would be the 'population explosion' or any kind of epidemic forecast. I am sure the same holds for any civilized country. Wrong. In a civilized country, you should be able to call for whatever you want. Psycho-babble. I'm hopeful it's just a translator problem. I'm going to ask the TechnoCore to check you out now. I think it depends on your understanding/definition of the Singularity. Go back to the physical analogy. As you approach the event horizon your perspective changes. What used to be a "wall" isn't so anymore. Time stretches. Years become days. Centuries shorten to seconds. Now come back to the technological singularity. As we approach what today appears to be the singularity, our perspective will change. We will see the distinct steps that take us forward, but today that path is unimaginable. We can't see the steps from here; without foreknowledge we won't be able to see our path forward past a certain point. Just for fun, put yourself in the place of Einstein. Where would the singularity be from his perspective? In what scientific areas have we already reached it? Now go back to Newton. Was his "Singularity" maybe 50 years ago? Now go back to Aristotle, 100 years ago? At what point could they fail to see beyond, or even imagine the progress / recognize the world we have become? At what point was there no return to the old way of living/existing? What does the Singularity really mean? Remember that the analogy has its limits so don't get stuck on the physical event horizon metaphor. I think when the Singularity is depends on when you are. As things continue to accelerate, I agree, there is going to be a "plateau" where we hit some kind of limit. I think VD is way too pessimistic though in his flops. More better is coming faster than most of us imagine. I thought that the "singularity" was defined at the time when humans were no longer needed to Design and Produce increasingly powerful computers. I.E., technological advancement became a self-sutaining process. There's a lot of jibber jabber about robotics and physical processing limits, but if you accept the above definition, well, it could be considered a somewhat discrete time. @hyongx: Your definition sounds like Vinge's, who coined the term, but I think the terms use isn't limited as you stated it. "In futures studies, the singularity represents an "event horizon" in the predictability of human technological development past which present models of the future cease to give reliable or accurate answers, following the creation of strong AI or the enhancement of human intelligence. " Too bad the current AI research is based on the behaviourist argument that an answering machine is a real intelligence as long as you don't realize you're listening to a recording. Not so. The oceans, skies, and other marginal lands will become more habitable by virtue of technologies that enhance our ability to live in different, sometimes even extreme, conditions. Living in new places will come with new found abilities to convert the energy of the sun and earth to produce healthy food, etc. At present, we use only 1/10,000 of the energy input from the sun. There is, and will be, plenty of room and resources to produce a pleasantly prosperous lifestyle for everyone. We have,and will continue to have, the technical prowess to produce such a result. War,famine, and other tragic outcomes are not inevitable. Being realistic about it means we need to focus on understanding our options and choosing well. And creating new options. Kurzweil's predictions are repeatedly wrong, then when he's exposed, he tries to change what he said to make it look like he meant something else. If you read his interviews it's obvious he's terrified of death and has invented all this fantasy so he won't have to confront it. The Singularity movement reminds me of a religious cult- promising salvation if only you'll drink its koolaid and ignore all contradictory evidence. Too bad, many of it's proponents are quite smart. What a waste of intelligence. Since when were our sensorimotor cortices NOT in the field of physical reality? More of the daft anthropocentric ramblings of the transhumanist cult. Certainly if we can avoid extinction and can make our species compatible with the new non-biological phase of the life process which is already a "work in progress" as what we at present call the Internet, then we might indeed experience a "golden age". But to become successful symbiotes we must suppress the belligerence which has been so important in the evolution of our species.